Chesapeake Bay Environmental Center (CBEC). a Great Horned Owl and a Screech Owl! Learn about their history and habits and their importance to our ecosystem. Examine and dissect pellets to determine their diets! Beat our Local Chess Master! 1:00-1:30- A mini lesson for beginners. 1:30-4:00pm- The Master will challenge players at the same table at the same time, or players can challenge each other. 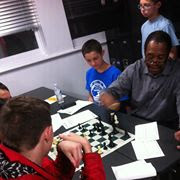 GCA Children's Chess is run by Greg Acholonu, a U.S. Chess Federation Certified Coach and National Master who has been teaching children the "King's Game" for over a decade. Greg's passion for chess is most evident in his instruction of children. He knows the important life skills chess teaches such as strategy and patience and receives great satisfaction in helping with the development of young minds! Greg is happy to have the opportunity to share his passion with rising generations of chess players. "For life is a kind of Chess...By playing at Chess then, we may learn..."
FREE EVENT! No sign-up needed! Hear Winners of the Anne Arundel County Reading Council's 2018-2019 Young Author's Contest (Elementary Level) read their stories or poems.